Palm trees and white sandy beaches surrounded by turquoise blue waters is my idea of paradise… and paradise is what we found when we arrived in the Cook Islands. From Los Angeles, we took a direct flight via Air New Zealand from Los Angeles to Rarotonga, Cook Islands. We flew in their award winning business class seats with great food, wine and incredible service. My favourite thing about this flight is that its a red eye so you can get an entire nights sleep throughout the journey which is roughly 8h30m up in the air. Upon arrival, we were welcomed with fresh flowered necklaces and taken to our accommodation - Pacific Resort Rarotonga. There we walked into our Beachfront Suite where we had an amazing view of the water and beach from our balcony. Before we got on with our day, we decided to have brunch at the buffet where our table was right on the beach. Was this real life? The trip was off to a great start. After breakfast we wanted to do a quick preview of the island in our SUV. You can drive all the way around in no more than 45 minutes. There are no traffic lights and only two crosswalks on the whole island. The speed limit is 30 or 50 (km) thus, no one wears seat belts. There are two bus routes: clockwise and anti-clockwise. You’re now in paradise so there is no need to rush - and we were in no rush either (except that we wanted to see as much as possible while there)! Around the island there are countless beautiful beaches, friendly locals, and great places to eat. Rarotonga is also a mountainous island and there is plenty of lush tropical greenery to hike through - with viewpoints of the infamous “needle,” a pinnacle of rock that stands out among the rest. Best of all, there are no snakes or dangerous animals to be worried about, just lots and lots of roosters and goats. While in Rarotonga, we spend time on the beaches, snorkelling, paddle boarding, hiking, and more. Getting up for sunrise and lounging in a hammock for sunset were integral parts of our daily routine. There were also many dogs that love to roam free and play on the beach and in the water - and we made friends with them as well. After three days in Rarotonga, it was time to take a 52 minute flight via Air Rarotonga to the next island - Aitutaki. This was an even smaller island, one of 11 additional islands to Rarotonga, and the water was even more blue. We couldn’t believe our eyes as we approached the lagoon. Here we're once again greeted then taken to the Pacific Resort Aitutaki. With only 27 units and an incredible infinity pool overlooking the ocean, this is the only 5-star resort in all of the Cook Islands. Here we checked into our breathtaking Beachfront Bungalow and went snorkelling almost immediately in the irresistible water. Once again, to get a feel for this island, we wanted to go for a drive and see what this island was all about. Again, much smaller and less developed - it was amazing. 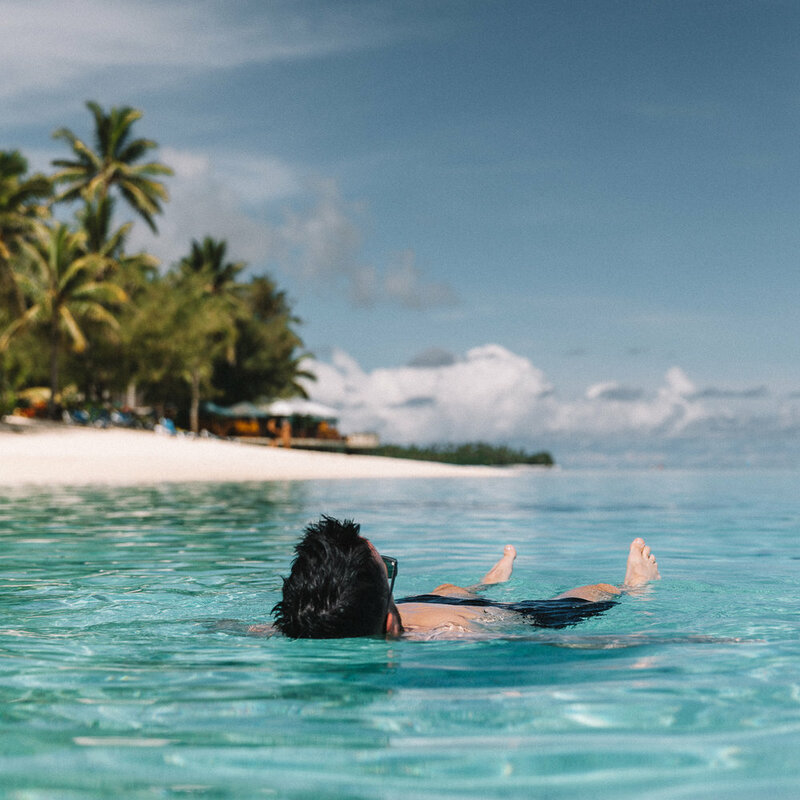 The highlights of our time in Aitutaki include the dance performances by locals at a couple different events, exploring the giant Banyan Tree that arches over the road, snorkelling, and without a doubt our private lagoon tour. By boat, our guide took us to many smaller islands where we were the only people on it. The whitest sand beaches and the bluest water we had ever seen. Some of these islands were the locations for the well known TV show, Survivor: Cook Islands.. The islands are uninhabited so if you ever imaged what it would be like to be on one of the islands you see in postcards, that’s what it was like. It was a very special experience and perhaps one of our favourite moments of the trip. One thing to note about Cook Islands is that it does not feel very touristy and overdeveloped. They have stayed true to their culture and they respect the land and water around them, but it's developed enough that you can get 99% of the things you would ever need while there. Be sure to eat lots of their freshly caught fish and be sure to eat at The Mooring Cafe on Rarotonga for a delicious fish sandwich. Make sure you wake up early for some of their famous sunrises and explore the backroads of Rarotonga and dive in to that lush rainforest as well as the turquoise blue water!